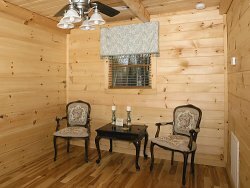 This is truly an executive cabin! 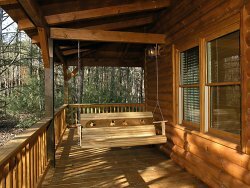 Three bedrooms with master suite and whirlpool tub. 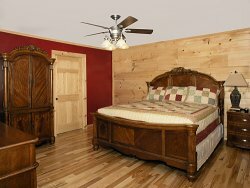 One Queen bed and one King bed in upstairs bedrooms and a murphy bed upstairs that would comfortably sleep a family of eight! 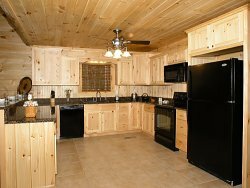 The kitchen is very nice with granite countertops and all appliances including a washer and dryer. 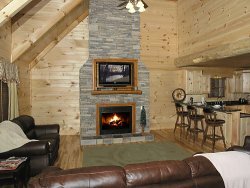 The stackstone fireplace is great for those cool nights, and the hot tub on the screened porch is so relaxing you’ll never want to leave! 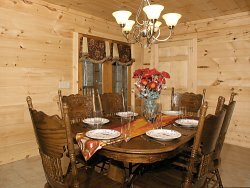 Sit back, relax, and enjoy a great Smoky Mountain family vacation!